I was really hoping to have the Transporter Cargo Bike ready to show off for this morning’s blog, so far this year has turned our area into a rain forest. Sure, it’s great for the garden and berry trees, but not great for getting any welding or building time in because my shack has no doors or windows and leaks when it rains. Add to that the 2 foot tall grass and I am starting to wonder if perhaps winter would be more productive after all! OK, enough complaining I will save that for the end of the blog! While searching for something else to blog about, I thought of what it takes to turn an idea into a working project. I divide the process into three steps: paper, prototype and then plan. Most of the time, an idea never leaves the paper stage. I currently have 43 full spiral ringed notebooks of bike ideas that I have collected from over the last five years. Sadly, I never kept notebooks before that time, so a lot of cool and crazy ideas ended up in the recycle bin. I usually start with a few pages of rough sketching just to get my head around the basic idea and how it might look. It takes only a few minutes to sketch up a bike. The sketches offer a decent view of many of the difficulties in designing a bike or trike such as chain line, seating position and steering. I can usually determine if an idea is viable within a few pages worth of sketching, and by the 10th drawing often the bike or trike is radically different than the original idea. 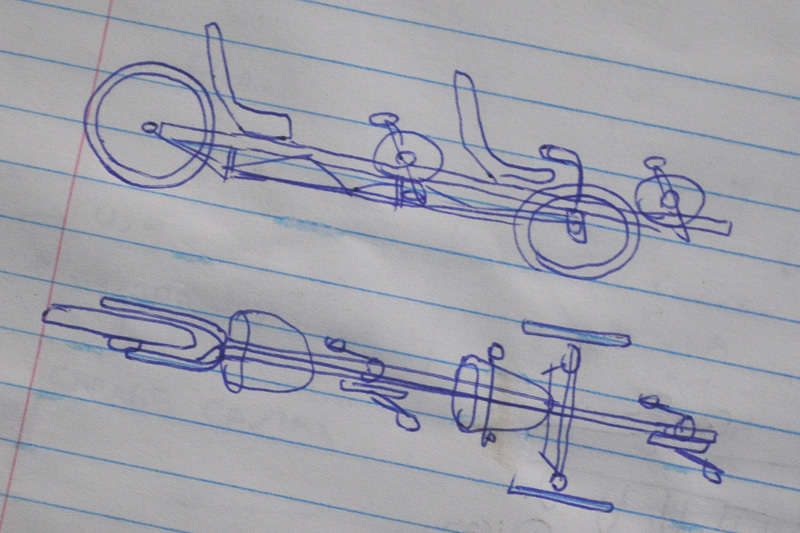 This tandem tadpole trike sketch seemed workable, so it was one of the few drawings from several thousand that moved to stage two – prototype. All of the AZ plans go through a prototype stage so that ideas can be tested in the real world and then either modified or scrapped. Having a rough prototype means I can beat the hell out of the vehicle and see what it can take, making any adjustments that may be necessary. 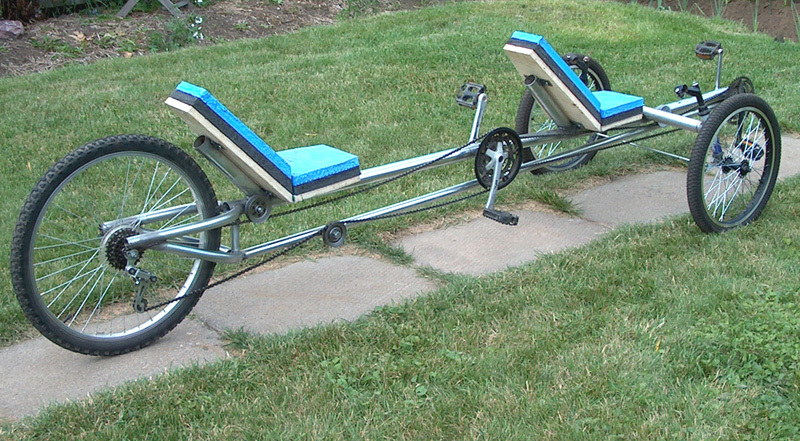 This tandem trike proto was made of electrical conduit and BMX wheels and took about two weekends to put together. We tested this trike at a campground for three days, beating it up over trails, down rough gravel roads, and even off road at times. It held up, even though there was no frame trussing and many of the welds were only half finished. My thinking is that if a poorly build proto can hold up to abuse, then a properly built final design would certainly hold up to just about any conditions. So, the next step was to turn proto into plan. 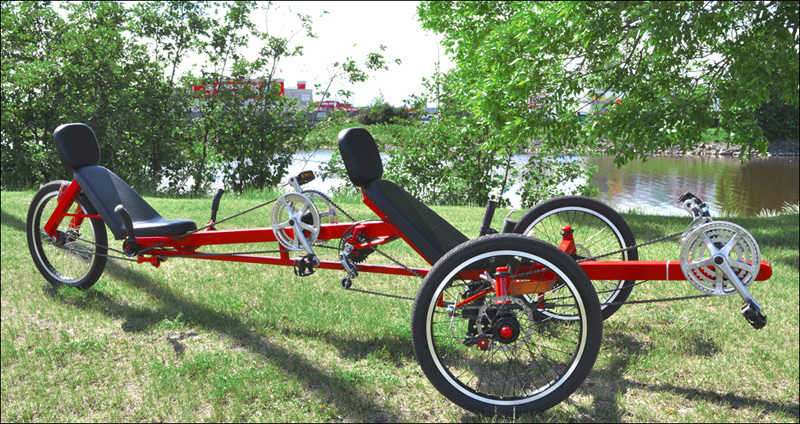 When I built the Viking Tandem Trike based on the original prototype, I made it a lot more durable and added many new features such as an unlinked transmission system, adjustable bottom brackets, dual disc brakes and under seat steering. The 1.25 inch conduit was replaced by 2 inch square tubing and the frame was properly triangulated for supreme strength. Building a plan from a prototype is a much longer process because every step has to be meticulously photographed and documented, but it is worth the effort when I see completed projects based on our plans being posted in the gallery. So I am 95% into the plan stage on the Transporter Cargo Bike and only need to add the brake and shifter cables to complete the plan. But, the rain-man seems to have other plans, keeping me indoors as of late. 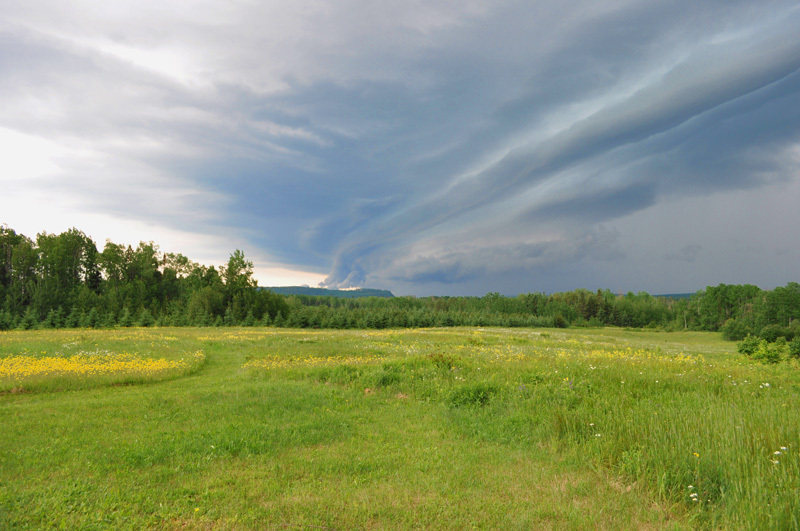 The weather report has been practically the exact same for more than a month – a 40% chance of thunder showers and high humidity. What that means is that it spits rain once every few hours and dumps rain once a day. The grass is constantly wet, and my bike building shack smells like the back of uncle Jeb’s cabin…ack! I am at the point where I need a nice dry sunny day to get the final photos done, even if the rain holds off for four hours, I would be happy. Oh well, the apples and berry trees are sure enjoying the new rain forest, but the lawn is getting so tall it may take three days to hand mow the yard the next chance I get! I wonder, is there such a thing as an anti-rain dance? 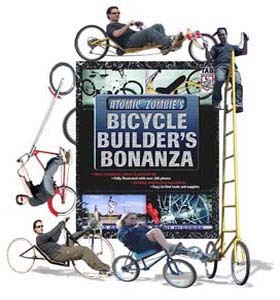 This entry was posted in bicycles, bike forks, bikes, Blogroll, cargo bikes, choppers, cycles, DIY, do it yourself, electric bicycles, electric bikes, electric vehicles, gadgets, garage hacker, handcycle, homebuilt, hub motor, kyoto, recumbents, tandems, transportation, trikes, Uncategorized, velomobile, welding and tagged atomiczombie, bike plans, cargo bicycles, cycling, diy bikes, outdoors, recumbents, tadpole trikes, velomobiles, welding. Bookmark the permalink.